Joining the campaign for the latest installment of the fast food chain's popular Monopoly game. LeBron James' rejuvenated hairline turned out to be a false alarm, but it wasn't a concern of his when shooting this new commercial with his partners at McDonald's. Joining the campaign for the latest installment of the fast food chain's popular Monopoly game, James is featured in the new spot and one-ups Pharrell by donning the iconic top hat piece. 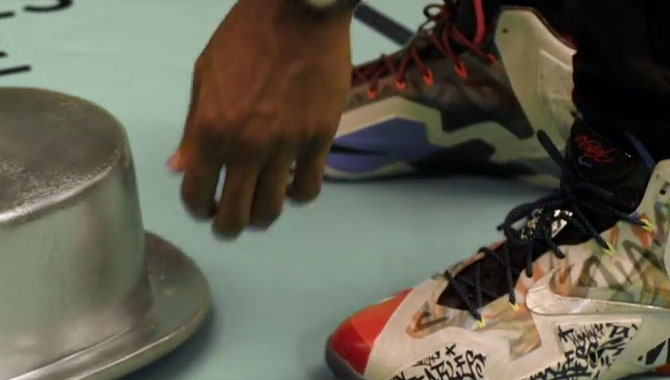 Before he picks it up, we see him walking the board in the recently released 'What The' Nike LeBron 11.